"Keats" redirects here. For other uses, see Keats (disambiguation). John Keats (/kiːts/; 31 October 1795 – 23 February 1821) was an English Romantic poet. He was one of the main figures of the second generation of Romantic poets, along with Lord Byron and Percy Bysshe Shelley, despite his works having been in publication for only four years before his death from tuberculosis at the age of 25. Although his poems were not generally well received by critics during his lifetime, his reputation grew after his death, and by the end of the 19th century, he had become one of the most beloved of all English poets. He had a significant influence on a diverse range of poets and writers. Jorge Luis Borges stated that his first encounter with Keats' work was the most significant literary experience of his life. The poetry of Keats is characterised by sensual imagery, most notably in the series of odes. This is typical of romantic poets, as they aimed to accentuate extreme emotion through an emphasis on natural imagery. Today his poems and letters are some of the most popular and most analysed in English literature. Some of the most acclaimed works of Keats are "Ode to a Nightingale", "Sleep and Poetry", and the famous sonnet "On First Looking into Chapman's Homer". John Keats was born in Moorgate, London, on 31 October 1795 to Thomas Keats and his wife, Frances Jennings. There is little evidence of his exact birthplace. Although Keats and his family seem to have marked his birthday on 29 October, baptism records give the date as the 31st. He was the eldest of four surviving children; his younger siblings were George (1797–1841), Thomas (1799–1818), and Frances Mary "Fanny" (1803–1889) who eventually married Spanish author Valentín Llanos Gutiérrez. Another son was lost in infancy. His father first worked as a hostler at the stables attached to the Swan and Hoop Inn, an establishment he later managed, and where the growing family lived for some years. Keats believed that he was born at the inn, a birthplace of humble origins, but there is no evidence to support his belief. The Globe pub now occupies the site (2012), a few yards from the modern-day Moorgate station. He was baptised at St Botolph-without-Bishopsgate, and sent to a local dame school as a child. His parents were unable to afford Eton or Harrow, so in the summer of 1803, he was sent to board at John Clarke's school in Enfield, close to his grandparents' house. The small school had a liberal outlook and a progressive curriculum more modern than the larger, more prestigious schools. In the family atmosphere at Clarke's, Keats developed an interest in classics and history, which would stay with him throughout his short life. The headmaster's son, Charles Cowden Clarke, also became an important mentor and friend, introducing Keats to Renaissance literature, including Tasso, Spenser, and Chapman's translations. The young Keats was described by his friend Edward Holmes as a volatile character, "always in extremes", given to indolence and fighting. However, at 13 he began focusing his energy on reading and study, winning his first academic prize in midsummer 1809. In April 1804, when Keats was eight, his father died from a skull fracture, suffered when he fell from his horse while returning from a visit to Keats and his brother George at school. Thomas Keats died intestate. Frances remarried two months later, but left her new husband soon afterwards, and the four children went to live with their grandmother, Alice Jennings, in the village of Edmonton. In March 1810, when Keats was 14, his mother died of tuberculosis, leaving the children in the custody of their grandmother. She appointed two guardians, Richard Abbey and John Sandell, to take care of them. That autumn, Keats left Clarke's school to apprentice with Thomas Hammond, a surgeon and apothecary who was a neighbour and the doctor of the Jennings family. Keats lodged in the attic above the surgery at 7 Church Street until 1813. Cowden Clarke, who remained a close friend of Keats, described this period as "the most placid time in Keats' life." From 1814, Keats had two bequests, held in trust for him until his 21st birthday: £800 willed by his grandfather John Jennings (about £50,000 in today's money) and a portion of his mother's legacy, £8000 (about £500,000 today), to be equally divided between her living children. [nb 1] It seems he was not told of either, since he never applied for any of the money. Historically, blame has often been laid on Abbey as legal guardian, but he may also have been unaware. William Walton, solicitor for Keats' mother and grandmother, definitely did know and had a duty of care to relay the information to Keats. It seems he did not. The money would have made a critical difference to the poet's expectations. Money was always a great concern and difficulty for him, as he struggled to stay out of debt and make his way in the world independently. The sonnet "On First Looking into Chapman's Homer"
Having finished his apprenticeship with Hammond, Keats registered as a medical student at Guy's Hospital (now part of King's College London) and began studying there in October 1815. Within a month of starting, he was accepted as a dresser at the hospital, assisting surgeons during operations, the equivalent of a junior house surgeon today. It was a significant promotion, that marked a distinct aptitude for medicine; it brought greater responsibility and a heavier workload. Keats' long and expensive medical training with Hammond and at Guy's Hospital led his family to assume he would pursue a lifelong career in medicine, assuring financial security, and it seems that at this point Keats had a genuine desire to become a doctor. He lodged near the hospital, at 28 St Thomas's Street in Southwark, with other medical students, including Henry Stephens who became a famous inventor and ink magnate. However, Keats' training took up increasing amounts of his writing time, and he was increasingly ambivalent about his medical career. He felt that he faced a stark choice. He had written his first extant poem, "An Imitation of Spenser," in 1814, when he was 19. Now, strongly drawn by ambition, inspired by fellow poets such as Leigh Hunt and Lord Byron, and beleaguered by family financial crises, he suffered periods of depression. His brother George wrote that John "feared that he should never be a poet, & if he was not he would destroy himself". In 1816, Keats received his apothecary's licence, which made him eligible to practise as an apothecary, physician, and surgeon, but before the end of the year he announced to his guardian that he was resolved to be a poet, not a surgeon. Although he continued his work and training at Guy's, Keats devoted more and more time to the study of literature, experimenting with verse forms, particularly the sonnet. In May 1816, Leigh Hunt agreed to publish the sonnet "O Solitude" in his magazine, The Examiner, a leading liberal magazine of the day. It was the first appearance in print of Keats' poetry, and Charles Cowden Clarke described it as his friend's red letter day, the first proof that Keats' ambitions were valid. Among his poems of 1816 was To My Brothers. In the summer of that year, Keats went with Clarke to the seaside town of Margate to write. There he began "Calidore" and initiated the era of his great letter writing. On his return to London, he took lodgings at 8 Dean Street, Southwark, and braced himself for further study in order to become a member of the Royal College of Surgeons. In October 1816, Clarke introduced Keats to the influential Leigh Hunt, a close friend of Byron and Shelley. Five months later came the publication of Poems, the first volume of Keats' verse, which included "I stood tiptoe" and "Sleep and Poetry," both strongly influenced by Hunt. The book was a critical failure, arousing little interest, although Reynolds reviewed it favourably in The Champion. Clarke commented that the book "might have emerged in Timbuctoo." Keats' publishers, Charles and James Ollier, felt ashamed of the book. Keats immediately changed publishers to Taylor and Hessey on Fleet Street. Unlike the Olliers, Keats' new publishers were enthusiastic about his work. Within a month of the publication of Poems they were planning a new Keats volume and had paid him an advance. Hessey became a steady friend to Keats and made the company's rooms available for young writers to meet. Their publishing lists eventually included Coleridge, Hazlitt, Clare, Hogg, Carlyle and Lamb. Through Taylor and Hessey, Keats met their Eton-educated lawyer, Richard Woodhouse, who advised them on literary as well as legal matters and was deeply impressed by Poems. Although he noted that Keats could be "wayward, trembling, easily daunted," Woodhouse was convinced of Keats' genius, a poet to support as he became one of England's greatest writers. Soon after they met, the two became close friends, and Woodhouse started to collect Keatsiana, documenting as much as he could about Keats' poetry. This archive survives as one of the main sources of information on Keats' work. Andrew Motion represents him as Boswell to Keats' Johnson, ceaselessly promoting the writer's work, fighting his corner, and spurring his poetry to greater heights. In later years, Woodhouse was one of the few people to accompany Keats to Gravesend to embark on his final trip to Rome. In spite of the bad reviews of Poems, Hunt published the essay "Three Young Poets" (Shelley, Keats, and Reynolds) and the sonnet "On First Looking into Chapman's Homer," foreseeing great things to come. He introduced Keats to many prominent men in his circle, including the editor of The Times, Thomas Barnes; the writer Charles Lamb; the conductor Vincent Novello; and the poet John Hamilton Reynolds, who would become a close friend. He was also regularly meeting William Hazlitt, a powerful literary figure of the day. It was a decisive turning point for Keats, establishing him in the public eye as a figure in what Hunt termed "a new school of poetry." At this time Keats wrote to his friend Bailey: "I am certain of nothing but the holiness of the Heart's affections and the truth of the imagination. What imagination seizes as Beauty must be truth." This passage would eventually be transmuted into the concluding lines of "Ode on a Grecian Urn": "'Beauty is truth, truth beauty' – that is all / Ye know on earth, and all ye need to know". In early December 1816, under the heady influence of his artistic friends, Keats told Abbey that he had decided to give up medicine in favour of poetry, to Abbey's fury. Keats had spent a great deal on his medical training and, despite his state of financial hardship and indebtedness, had made large loans to friends such as painter Benjamin Haydon. Keats would go on to lend £700 to his brother George. By lending so much, Keats could no longer cover the interest of his own debts. Having left his training at the hospital, suffering from a succession of colds, and unhappy with living in damp rooms in London, Keats moved with his brothers into rooms at 1 Well Walk in the village of Hampstead in April 1817. Both John and George nursed their brother Tom, who was suffering from tuberculosis. The house was close to Hunt and others from his circle in Hampstead, as well as to Coleridge, respected elder of the first wave of Romantic poets, at that time living in Highgate. On 11 April 1818, Keats reported that he and Coleridge had a long walk together on Hampstead Heath. In a letter to his brother George, Keats wrote that they talked about "a thousand things,... nightingales, poetry, poetical sensation, metaphysics." Around this time he was introduced to Charles Wentworth Dilke and James Rice. In June 1818, Keats began a walking tour of Scotland, Ireland, and the Lake District with his friend Charles Armitage Brown. Keats' brother George and his wife Georgina accompanied them as far as Lancaster and then continued to Liverpool, from where the couple emigrated to America. They lived in Ohio and Louisville, Kentucky, until 1841, when George's investments failed. Like Keats' other brother, they both died penniless and racked by tuberculosis, for which there was no effective treatment until the next century. In July, while on the Isle of Mull, Keats caught a bad cold and "was too thin and fevered to proceed on the journey." After his return south in August, Keats continued to nurse Tom, exposing himself to infection. Some biographers suggest that this is when tuberculosis, his "family disease," first took hold. "Consumption" was not identified as a disease with a single infectious origin until 1820, and there was considerable stigma attached to the condition, as it was often associated with weakness, repressed sexual passion, or masturbation. Keats "refuses to give it a name" in his letters. 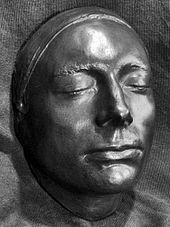 Tom Keats died on 1 December 1818. John Keats moved to the newly built Wentworth Place, owned by his friend Charles Armitage Brown. It was on the edge of Hampstead Heath, ten minutes' walk south of his old home in Well Walk. The winter of 1818–19, though a difficult period for the poet, marked the beginning of his annus mirabilis in which he wrote his most mature work. He had been inspired by a series of recent lectures by Hazlitt on English poets and poetic identity and had also met Wordsworth. Keats may have seemed to his friends to be living on comfortable means, but in reality he was borrowing regularly from Abbey and his friends. He composed five of his six great odes at Wentworth Place in April and May and, although it is debated in which order they were written, "Ode to Psyche" opened the published series. According to Brown, "Ode to a Nightingale" was composed under a plum tree in the garden. [nb 2] Brown wrote, "In the spring of 1819 a nightingale had built her nest near my house. Keats felt a tranquil and continual joy in her song; and one morning he took his chair from the breakfast-table to the grass-plot under a plum-tree, where he sat for two or three hours. When he came into the house, I perceived he had some scraps of paper in his hand, and these he was quietly thrusting behind the books. On inquiry, I found those scraps, four or five in number, contained his poetic feelings on the song of our nightingale." Dilke, co-owner of the house, strenuously denied the story, printed in Richard Monckton Milnes' 1848 biography of Keats, dismissing it as 'pure delusion'. "Ode on a Grecian Urn" and "Ode on Melancholy" were inspired by sonnet forms and probably written after "Ode to a Nightingale". Keats' new and progressive publishers Taylor and Hessey issued Endymion, which Keats dedicated to Thomas Chatterton, a work that he termed "a trial of my Powers of Imagination". It was damned by the critics, giving rise to Byron's quip that Keats was ultimately "snuffed out by an article", suggesting that he never truly got over it. A particularly harsh review by John Wilson Croker appeared in the April 1818 edition of The Quarterly Review. [nb 3] John Gibson Lockhart writing in Blackwood's Magazine, described Endymion as "imperturbable drivelling idiocy". With biting sarcasm, Lockhart advised, "It is a better and a wiser thing to be a starved apothecary than a starved poet; so back to the shop Mr John, back to plasters, pills, and ointment boxes". [nb 4] It was Lockhart at Blackwoods who coined the defamatory term "the Cockney School" for Hunt and his circle, which included both Hazlitt and Keats. The dismissal was as much political as literary, aimed at upstart young writers deemed uncouth for their lack of education, non-formal rhyming and "low diction". They had not attended Eton, Harrow or Oxbridge and they were not from the upper classes. 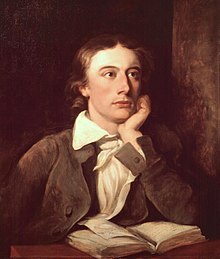 In 1819, Keats wrote "The Eve of St. Agnes", "La Belle Dame sans Merci", "Hyperion", "Lamia" and a play, Otho the Great (critically damned and not performed until 1950). The poems "Fancy" and "Bards of passion and of mirth" were inspired by the garden of Wentworth Place. In September, very short of money and in despair considering taking up journalism or a post as a ship's surgeon, he approached his publishers with a new book of poems. They were unimpressed with the collection, finding the presented versions of "Lamia" confusing, and describing "St Agnes" as having a "sense of pettish disgust" and "a 'Don Juan' style of mingling up sentiment and sneering" concluding it was "a poem unfit for ladies". The final volume Keats lived to see, Lamia, Isabella, The Eve of St. Agnes, and Other Poems, was eventually published in July 1820. It received greater acclaim than had Endymion or Poems, finding favourable notices in both The Examiner and Edinburgh Review. It would come to be recognised as one of the most important poetic works ever published. Wentworth Place now houses the Keats House museum. Keats befriended Isabella Jones in May 1817, while on holiday in the village of Bo Peep, near Hastings. She is described as beautiful, talented and widely read, not of the top flight of society yet financially secure, an enigmatic figure who would become a part of Keats' circle. Throughout their friendship Keats never hesitates to own his sexual attraction to her, although they seem to enjoy circling each other rather than offering commitment. He writes that he "frequented her rooms" in the winter of 1818–19, and in his letters to George says that he "warmed with her" and "kissed her". The trysts may have been a sexual initiation for Keats according to Bate and Gittings. Jones inspired and was a steward of Keats' writing. The themes of "The Eve of St. Agnes" and "The Eve of St Mark" may well have been suggested by her, the lyric Hush, Hush! ["o sweet Isabel"] was about her, and that the first version of "Bright Star" may have originally been for her. In 1821, Jones was one of the first in England to be notified of Keats' death. Letters and drafts of poems suggest that Keats first met Frances (Fanny) Brawne between September and November 1818. It is likely that the 18-year-old Brawne visited the Dilke family at Wentworth Place before she lived there. She was born in the hamlet of West End (now in the district of West Hampstead), on 9 August 1800. Like Keats' grandfather, her grandfather kept a London inn, and both lost several family members to tuberculosis. She shared her first name with both Keats' sister and mother, and had a talent for dress-making and languages as well as a natural theatrical bent. During November 1818 she developed an intimacy with Keats, but it was shadowed by the illness of Tom Keats, whom John was nursing through this period. On 3 April 1819, Brawne and her widowed mother moved into the other half of Dilke's Wentworth Place, and Keats and Brawne were able to see each other every day. Keats began to lend Brawne books, such as Dante's Inferno, and they would read together. He gave her the love sonnet "Bright Star" (perhaps revised for her) as a declaration. It was a work in progress which he continued at until the last months of his life, and the poem came to be associated with their relationship. "All his desires were concentrated on Fanny". From this point there is no further documented mention of Isabella Jones. Sometime before the end of June, he arrived at some sort of understanding with Brawne, far from a formal engagement as he still had too little to offer, with no prospects and financial stricture. Keats endured great conflict knowing his expectations as a struggling poet in increasingly hard straits would preclude marriage to Brawne. Their love remained unconsummated; jealousy for his 'star' began to gnaw at him. Darkness, disease and depression surrounded him, reflected in poems such as "The Eve of St. Agnes" and "La Belle Dame sans Merci" where love and death both stalk. "I have two luxuries to brood over in my walks;" he wrote to her, "...your loveliness, and the hour of my death". In one of his many hundreds of notes and letters, Keats wrote to Brawne on 13 October 1819: "My love has made me selfish. I cannot exist without you – I am forgetful of every thing but seeing you again – my Life seems to stop there – I see no further. You have absorb'd me. I have a sensation at the present moment as though I was dissolving – I should be exquisitely miserable without the hope of soon seeing you ... I have been astonished that Men could die Martyrs for religion – I have shudder'd at it – I shudder no more – I could be martyr'd for my Religion – Love is my religion – I could die for that – I could die for you." Tuberculosis took hold and he was advised by his doctors to move to a warmer climate. In September 1820 Keats left for Rome knowing he would probably never see Brawne again. After leaving he felt unable to write to her or read her letters, although he did correspond with her mother. He died there five months later. None of Brawne's letters to Keats survive. It took a month for the news of his death to reach London, after which Brawne stayed in mourning for six years. In 1833, more than 12 years after his death, she married and went on to have three children; she outlived Keats by more than 40 years. During 1820 Keats displayed increasingly serious symptoms of tuberculosis, suffering two lung haemorrhages in the first few days of February. On first coughing up blood, on 3 February 1820, he said to Charles Armitage Brown, "I know the colour of that blood! It is arterial blood. I cannot be deceived in that colour. That drop of blood is my death warrant. I must die." He lost large amounts of blood and was bled further by the attending physician. Hunt nursed him in London for much of the following summer. At the suggestion of his doctors, he agreed to move to Italy with his friend Joseph Severn. On 13 September, they left for Gravesend and four days later boarded the sailing brig Maria Crowther, where he made the final revisions of "Bright Star". The journey was a minor catastrophe: storms broke out followed by a dead calm that slowed the ship's progress. When they finally docked in Naples, the ship was held in quarantine for ten days due to a suspected outbreak of cholera in Britain. Keats reached Rome on 14 November, by which time any hope of the warmer climate he sought had disappeared. Keats wrote his last letter on 30 November 1820 to Charles Armitage Brown; "Tis the most difficult thing in the world to me to write a letter. My stomach continues so bad, that I feel it worse on opening any book – yet I am much better than I was in Quarantine. Then I am afraid to encounter the proing and conning of any thing interesting to me in England. I have an habitual feeling of my real life having past, and that I am leading a posthumous existence". 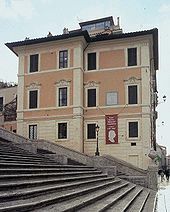 On arrival in Italy, he moved into a villa on the Spanish Steps in Rome, today the Keats–Shelley Memorial House museum. Despite care from Severn and Dr. James Clark, his health rapidly deteriorated. The medical attention Keats received may have hastened his death. In November 1820, Clark declared that the source of his illness was "mental exertion" and that the source was largely situated in his stomach. Clark eventually diagnosed consumption (tuberculosis) and placed Keats on a starvation diet of an anchovy and a piece of bread a day intended to reduce the blood flow to his stomach. He also bled the poet: a standard treatment of the day, but also likely a significant contributor to Keats' weakness. Severn's biographer Sue Brown writes: "They could have used opium in small doses, and Keats had asked Severn to buy a bottle of opium when they were setting off on their voyage. What Severn didn't realise was that Keats saw it as a possible resource if he wanted to commit suicide. He tried to get the bottle from Severn on the voyage but Severn wouldn't let him have it. Then in Rome he tried again... Severn was in such a quandary he didn't know what to do, so in the end he went to the doctor who took it away. As a result Keats went through dreadful agonies with nothing to ease the pain at all." Keats was angry with both Severn and Clark when they would not give him laudanum (opium). He repeatedly demanded "how long is this posthumous existence of mine to go on?" Keats raves till I am in a complete tremble for him...about four, the approaches of death came on. [Keats said] "Severn—I—lift me up—I am dying—I shall die easy; don't be frightened—be firm, and thank God it has come." I lifted him up in my arms. The phlegm seem'd boiling in his throat, and increased until eleven, when he gradually sank into death, so quiet, that I still thought he slept. Sed mulier cupido quod dicit amanti / in vento et rapida scribere oportet aqua (What a woman says to a passionate lover / should be written in the wind and the running water). Seven weeks after the funeral Shelley memorialised Keats in his poem Adonaïs. Clark saw to the planting of daisies on the grave, saying that Keats would have wished it. For public health reasons, the Italian health authorities burned the furniture in Keats' room, scraped the walls, made new windows, doors and flooring. The ashes of Shelley, one of Keats' most fervent champions, are buried in the cemetery and Joseph Severn is buried next to Keats. Describing the site today, Marsh wrote, "In the old part of the graveyard, barely a field when Keats was buried here, there are now umbrella pines, myrtle shrubs, roses, and carpets of wild violets". When Keats died at 25, he had been writing poetry seriously for only about six years, from 1814 until the summer of 1820; and publishing for only four. In his lifetime, sales of Keats' three volumes of poetry probably amounted to only 200 copies. His first poem, the sonnet O Solitude appeared in the Examiner in May 1816, while his collection Lamia, Isabella, The Eve of St. Agnes and other poems was published in July 1820 before his last visit to Rome. The compression of his poetic apprenticeship and maturity into so short a time is just one remarkable aspect of Keats' work. Although prolific during his short career, and now one of the most studied and admired British poets, his reputation rests on a small body of work, centred on the Odes, and only in the creative outpouring of the last years of his short life was he able to express the inner intensity for which he has been lauded since his death. Keats was convinced that he had made no mark in his lifetime. Aware that he was dying, he wrote to Fanny Brawne in February 1820, "I have left no immortal work behind me – nothing to make my friends proud of my memory – but I have lov'd the principle of beauty in all things, and if I had had time I would have made myself remember'd." Died on the promise of the fruit. Although Keats wrote that "if poetry comes not as naturally as the Leaves to a tree it had better not come at all", poetry did not come easily to him; his work was the fruit of a deliberate and prolonged classical self-education. He may have possessed an innate poetic sensibility, but his early works were clearly those of a young man learning his craft. His first attempts at verse were often vague, languorously narcotic and lacking a clear eye. His poetic sense was based on the conventional tastes of his friend Charles Cowden Clarke, who first introduced him to the classics, and also came from the predilections of Hunt's Examiner, which Keats read as a boy. Hunt scorned the Augustan or 'French' school, dominated by Pope, and attacked the earlier Romantic poets Wordsworth and Coleridge, now in their forties, as unsophisticated, obscure and crude writers. Indeed, during Keats' few years as a published poet, the reputation of the older Romantic school was at its lowest ebb. Keats came to echo these sentiments in his work, identifying himself with a 'new school' for a time, somewhat alienating him from Wordsworth, Coleridge and Byron and providing the basis from the scathing attacks from Blackwoods and The Quarterly. By the time of his death, Keats had therefore been associated with the taints of both old and new schools: the obscurity of the first wave Romantics and the uneducated affectation of Hunt's "Cockney School". Keats' posthumous reputation mixed the reviewers' caricature of the simplistic bumbler with the image of the hyper-sensitive genius killed by high feeling, which Shelley later portrayed. The Victorian sense of poetry as the work of indulgence and luxuriant fancy offered a schema into which Keats was posthumously fitted. Marked as the standard-bearer of sensory writing, his reputation grew steadily and remarkably. His work had the full support of the influential Cambridge Apostles, whose members included the young Tennyson,[nb 5] later a popular Poet Laureate who came to regard Keats as the greatest poet of the 19th century. Constance Naden was a great admirer of his poems, arguing that his genius lay in his 'exquisite sensitiveness to all the elements of beauty'. In 1848, twenty-seven years after Keats' death, Richard Monckton Milnes published the first full biography, which helped place Keats within the canon of English literature. The Pre-Raphaelite Brotherhood, including Millais and Rossetti, were inspired by Keats and painted scenes from his poems including "The Eve of St. Agnes", "Isabella" and "La Belle Dame sans Merci", lush, arresting and popular images which remain closely associated with Keats' work. In 1882, Swinburne wrote in the Encyclopædia Britannica that "the Ode to a Nightingale, [is] one of the final masterpieces of human work in all time and for all ages". 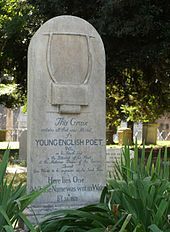 In the twentieth century, Keats remained the muse of poets such as Wilfred Owen, who kept his death date as a day of mourning, Yeats and T. S. Eliot. Critic Helen Vendler stated the odes "are a group of works in which the English language find ultimate embodiment". Bate declared of To Autumn: "Each generation has found it one of the most nearly perfect poems in English" and M. R. Ridley claimed the ode "is the most serenely flawless poem in our language." The largest collection of the letters, manuscripts, and other papers of Keats is in the Houghton Library at Harvard University. Other collections of material are archived at the British Library, Keats House, Hampstead, the Keats-Shelley Memorial House in Rome and the Pierpont Morgan Library in New York. Since 1998 the British Keats-Shelley Memorial Association have annually awarded a prize for romantic poetry. A Royal Society of Arts blue plaque was unveiled in 1896 to commemorate Keats at Keats House. None of Keats' biographies were written by people who had known him. Shortly after his death, his publishers announced they would speedily publish The memoirs and remains of John Keats but his friends refused to cooperate and argued with each other to the extent that the project was abandoned. Leigh Hunt's Lord Byron and some of his Contemporaries (1828) gives the first biographical account, strongly emphasising Keats' supposedly humble origins, a misconception which still continues. Given that he was becoming a significant figure within artistic circles, a succession of other publications followed, including anthologies of his many notes, chapters and letters. However, early accounts often gave contradictory or heavily biased versions of events and were subject to dispute. His friends Brown, Severn, Dilke, Shelley and his guardian Richard Abbey, his publisher Taylor, Fanny Brawne and many others issued posthumous commentary on Keats' life. These early writings coloured all subsequent biography and have become embedded in a body of Keats legend. Shelley promoted Keats as someone whose achievement could not be separated from agony, who was 'spiritualised' by his decline and too fine-tuned to endure the harshness of life; the consumptive, suffering image popularly held today. The first full biography was published in 1848 by Richard Monckton Milnes. Landmark Keats biographers since include Sidney Colvin, Robert Gittings, Walter Jackson Bate and Andrew Motion. The idealised image of the heroic romantic poet who battled poverty and died young was inflated by the late arrival of an authoritative biography and the lack of an accurate likeness. Most of the surviving portraits of Keats were painted after his death, and those who knew him held that they did not succeed in capturing his unique quality and intensity. John Keats: His Life and Death, the first major motion picture about the life of Keats, was produced in 1973 by Encyclopædia Britannica, Inc.. It was directed by John Barnes. John Stride played John Keats and Janina Faye played Fanny Brawne. The 2009 film Bright Star, written and directed by Jane Campion, focuses on Keats' relationship with Fanny Brawne. Inspired by the 1997 Keats biography penned by Andrew Motion, it stars Ben Whishaw as Keats and Abbie Cornish as Fanny. In Dan Wells's book A Night of Blacker Darkness, John Keats is portrayed in a comedic tone. He is the companion and sidekick of the protagonist. In Dan Simmons' book Hyperion, one of the characters is a clone of John Keats, of whom he possesses personality and memories. In Tim Powers' book The Stress of Her Regard, John Keats, along with Percy Shelley and Lord Byron, is the victim of a vampire and his gift with language and poetry is a direct consequence of the vampire breed's attention. The poem On death on a wall at Breestraat 113 in Leiden, Netherlands. Keats' letters were first published in 1848 and 1878. During the 19th century, critics deemed them unworthy of attention, distractions from his poetic works. During the 20th century they became almost as admired and studied as his poetry, and are highly regarded within the canon of English literary correspondence. T. S. Eliot described them as "certainly the most notable and most important ever written by any English poet." Keats spent a great deal of time considering poetry itself, its constructs and impacts, displaying a deep interest unusual amongst his milieu who were more easily distracted by metaphysics or politics, fashions or science. Eliot wrote of Keats' conclusions; "There is hardly one statement of Keats' about poetry which ... will not be found to be true, and what is more, true for greater and more mature poetry than anything Keats ever wrote." Few of Keats' letters are extant from the period before he joined his literary circle. From spring 1817, however, there is a rich record of his prolific and impressive skills as letter writer. Keats and his friends, poets, critics, novelists, and editors wrote to each other daily, and Keats' ideas are bound up in the ordinary, his day-to-day missives sharing news, parody and social commentary. They glitter with humour and critical intelligence. Born of an "unself-conscious stream of consciousness," they are impulsive, full of awareness of his own nature and his weak spots. When his brother George went to America, Keats wrote to him in great detail, the body of letters becoming "the real diary" and self-revelation of Keats' life, as well as containing an exposition of his philosophy, and the first drafts of poems containing some of Keats' finest writing and thought. Gittings describes them as akin to a "spiritual journal" not written for a specific other, so much as for synthesis. has no self – it is every thing and nothing – It has no character – it enjoys light and shade;... What shocks the virtuous philosopher, delights the camelion [chameleon] Poet. It does no harm from its relish of the dark side of things any more than from its taste for the bright one; because they both end in speculation. A Poet is the most unpoetical of any thing in existence; because he has no Identity – he is continually in for – and filling some other Body – The Sun, the Moon, the Sea and Men and Women who are creatures of impulse are poetical and have about them an unchangeable attribute – the poet has none; no identity – he is certainly the most unpoetical of all God's Creatures. There are areas of his life and daily routine that Keats does not describe. He mentions little about his childhood or his financial straits and is seemingly embarrassed to discuss them. There is a total absence of any reference to his parents. In his last year, as his health deteriorated, his concerns often gave way to despair and morbid obsessions. 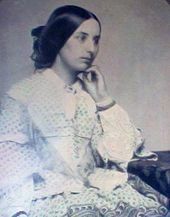 The publications of letters to Fanny Brawne in 1870 focused on this period and emphasised this tragic aspect, giving rise to widespread criticism at the time. John Keats. Ed. Susan Wolfson. Longman, 2007. Selected Letters of John Keats. Ed. Grant F. Scott. Harvard University Press, 2002. Complete Poems. Ed. Jack Stillinger. Harvard University Press, 1982. The Poems of John Keats. Ed. Jack Stillinger. Harvard University Press, 1978. The Letters of John Keats 1814–1821 Volumes 1 and 2 Ed. Hyder Edward Rollins. Harvard University Press, 1958. The Complete Poetical Works of John Keats. Ed. H. Buxton Forman. Oxford: Oxford University Press, 1907. The Complete Poetical Works and Letters of John Keats. ed. Horace Elisha Scudder. Boston: Riverside Press, 1899. ^ Keats' share would have increased on the death of his brother Tom in 1818. ^ The original plum tree no longer survives, though others have been planted since. ^ The Quarterly Review. April 1818. 204–08. "It is not, we say, that the author has not powers of language, rays of fancy, and gleams of genius – he has all these; but he is unhappily a disciple of the new school of what has been somewhere called 'Cockney Poetry'; which may be defined to consist of the most incongruous ideas in the most uncouth language ... There is hardly a complete couplet enclosing a complete idea in the whole book. He wanders from one subject to another, from the association, not of ideas, but of sounds." ^ Extracts from Blackwood's Edinburgh Magazine, 3 (1818) p519-24". Nineteenth Century Literary Manuscripts, Part 4. Retrieved 29 January 2010. "To witness the disease of any human understanding, however feeble, is distressing; but the spectacle of an able mind reduced to a state of insanity is, of course, ten times more afflicting. It is with such sorrow as this that we have contemplated the case of Mr John Keats .... He was bound apprentice some years ago to a worthy apothecary in town. But all has been undone by a sudden attack of the malady ... For some time we were in hopes that he might get off with a violent fit or two; but of late the symptoms are terrible. The phrenzy of the "Poems" was bad enough in its way; but it did not alarm us half so seriously as the calm, settled, imperturbable drivelling idiocy of Endymion .... It is a better and a wiser thing to be a starved apothecary than a starved poet; so back to the [apothecary] shop Mr John, back to 'plasters, pills, and ointment boxes' ". ^ Tennyson was writing Keats-style poetry in the 1830s and was being critically attacked in the same manner as his predecessor. ^ Bate p581: "Each generation has found it one of the most nearly perfect poems in English." ^ "Two become one at The Globe". Evening Standard. 12 August 2008. Retrieved 17 September 2012. ^ Motion, Andrew (15 April 1999). Keats. University of Chicago Press. ISBN 9780226542409. ^ "See the British National Archives for conversion rates". Nationalarchives.gov.uk. Retrieved 1 March 2014. ^ Keats, John (1816). "Sonnett VIII. To My Brothers". Allpoetry.com. Retrieved 31 October 2015. ^ Tracing the Keats Family in America New York Times Koch 30 July 1922. Retrieved 29 January 2010. ^ Zur Pathogenie der Impetigines. Auszug aus einer brieflichen Mitteilung an den Herausgeber. [Müller's] Archiv für Anatomie, Physiologie und wissenschaftliche Medicin. 1839, p82. ^ a b c d "Keats, John" The Oxford Companion to English Literature. Edited by Dinah Birch. Oxford University Press Inc.
^ Hart, Christopher. (2 August 2009.) "Savour John Keats' poetry in garden where he wrote". The Sunday Times. Retrieved 29 January 2010. ^ Keats, John; Gittings, Robert (1970). The odes of Keats and their earliest known manuscripts. Kent State University Press. ISBN 978-0873380997. ^ a b Kennedy, Maev. "Keats' London home reopens after major refurbishment". The Guardian, 22 July 2009. Retrieved 29 January 2010. ^ Houghton Library, Harvard University, I shall ever be your dearest love: John Keats and Fanny Brawne. "1820". ^ Porter, Roy (1 April 1998). The Greatest Benefit to Mankind: A Medical History of Humanity (The Norton History of Science). W. W. Norton & Company. p. 440?. ISBN 978-0393046342. ^ McCormick, Eric Hall (23 February 1989). "The Friend of Keats: A Life of Charles Armitage Brown". Victoria University Press. p. 60. Retrieved 23 February 2019 – via Google Books. ^ a b "A window to the soul of John Keats" by Marsh, Stefanie. The Times, 2 November 2009. Retrieved 29 January 2010. ^ a b c Flood, Alison. "Doctor's mistakes to blame for Keats' agonising end, says new biography". The Guardian, 26 October 2009. Retrieved 29 January 2010. ^ Adonais: An Elegy on the Death of John Keats. Representative Poetry Online. Retrieved 29 January 2010. ^ "Keats's keeper". Motion, Andrew. The Guardian, 7 May 2005. Retrieved 29 January 2010. ^ a b Andrew Motion (23 January 2010). "Article 23 January 2010 An introduction to the poetry of John Keats". London: Guardian. Retrieved 15 February 2010. ^ "John-Keats.com - Letters". www.john-keats.com. Retrieved 23 February 2019. ^ Adonaïs by Shelley is a despairing elegyof 495 lines and 55 Spenserian stanzas. It was published that July 1820 and he came to view it as his "least imperfect" work. ^ "University of Toronto – Adonaïs by Shelley". ^ 'Poesy Club', Mason College Magazine, 4.5 (October 1886), 106. ^ The Keats-Shelley Poetry Award. Retrieved 11 February 2010. ^ "KEATS, JOHN (1795–1821)". English Heritage. Retrieved 23 October 2012. ^ "John Keats: His Life and Death". Retrieved 23 February 2019 – via www.imdb.com. ^ The Academy of American Poets "Bright Star": Campion's Film About the Life and Love of Keats. ^ "Talking Pictures: 'Bright Star' – 2 1/2 stars". ^ "A Night of Blacker Darkness". Goodreads. Retrieved 6 February 2017. ^ "Hyperion (Hyperion Cantos, #1)". Goodreads. Retrieved 6 February 2017. ^ "The Stress of Her Regard". Goodreads. Retrieved 6 February 2017. Bate, Walter Jackson (2012). Negative Capability: The Intuitive Approach in Keats (1965), reprinted with a new intro by Maura Del Serra. New York: Contra Mundum Press, 2012. Chapman, D. (2012). What's in an Urn?, Concept, ISBN 978-1291143119. Gittings, Robert (1954). John Keats: The Living Year. 21 September 1818 to 21 September 1819. London: Heinemann. Gittings, Robert (1987) Selected poems and letters of Keats London: Heinemann. Jones, Michael (1984). "Twilight of the Gods: The Greeks in Schiller and Lukacs". Germanic Review. 59 (2): 49–56. doi:10.1080/00168890.1984.9935401. Lachman, Lilach (1988). "History and Temporalization of Space: Keats' Hyperion Poems". Proceedings of the XII Congress of the International Comparative Literature Association, edited by Roger Bauer and Douwe Fokkema (Munich, Germany): 159–164. Ridley, M. and R. Clarendon (1933). Keats' craftsmanship: a study in poetic development ASIN: B00085UM2I (Out of Print in 2010). Walsh, John Evangelist (1999). Darkling I Listen: The Last Days and Death of John Keats. New York: St. Martin's Press. Walsh, William (1957). "John Keats", in From Blake to Byron. Middlesex: Penguin. Bate, Walter Jackson. Negative Capability: The Intuitive Approach in Keats. New York: Contra Mundum Press, 2012. Kottoor, Gopikrishnan (1994). The Mask of Death: The Final Days of John Keats, (A Radio Play). Writers WorkShop Kolkata, 1994. Wikimedia Commons has media related to John Keats.